One of five "Armour Boys" by Laura Ford at the DeCordova Museum in Lincoln, Mass. 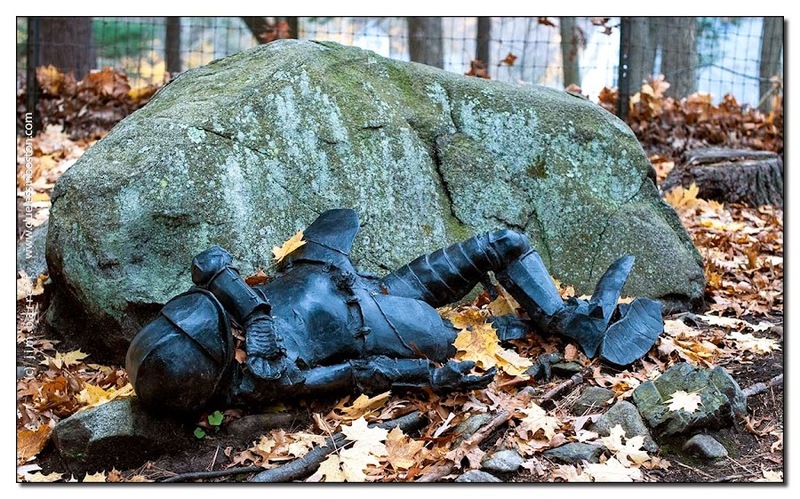 The bronze cast knights are scattered across the forest floor in various mangled poses. It looks like the soldier was attacked by a manatee. I like that! makes me think of the famous fight of Azincourt, in middle age. You'll have to go photograph the others. Strange subject for the States given that it represents a period of European warfare a good few years before we all sailed over the briny Atlantic. Might be interesting to know why she chose the subject and felt it appropriate - interesting. This is very unique. Thank you for sharing this. Looks like a movie scene! You have clever eyes, it's a fabulous capture! Dear Mr. Clueless, this is a great photo, but I'm hoping that you will show us a little of Boston during the holidays. I am missing your posts.